Whenever possible, all orders will be shipped the same day as ordered. If your order was placed after 3:00 pm Eastern time it will be processed the following business day. In all other cases, merchandise will be shipped as soon as possible. Please Note: Saturday and Sunday DO NOT count as business days. Orders placed for items "in stock" will ship the next day. NO Saturday Deliveries. Normal shipping can be from 5 to 7 business days or sooner. If we do not have your item in stock, we will contact you via email to notify you when the item will be shipped. Special order items vary on time frames but we will let you know to the best of our ability. We reserve the right to ship the Fedex, UPS or USPS. 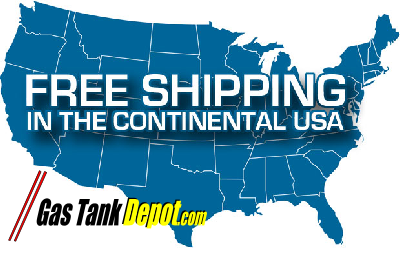 Free shipping applies to orders in the United States Lower 48 States. Not all products will qualify for free shipping. If free shipping is available it will be included in the product listing. We will ship either Fedex, UPS or United States Postal Service. You should receive your items at your door in 3-7 days or sooner in the USA. Orders that qualify for free shipping will be shipped the best way for us. We offer all shipping services shown during checkout including freight in the USA. Please contact us for any additional services needed. We can ship Fedex 2nd Day, Fedex Overnight and USPS Express services. Express Shipping is available for an additional charge Please call us for Express Shipping orders @386-788-8837. We offer USPS Mail shipping services to Alaska & Hawaii. Shipping is available to theses States for an additional charge. Please call us to orders @386-788-8837. FOR SHIPPING QUOTES ON INTERNATIONAL ORDERS PLEASE E-MAIL US AT sales@gastankdepot.com for shipping cost. International shipments will shipped by USPS Priority Mail. All duties and taxes will be charged upon delivery. All freight orders and Parcel Post deliveries will require you to pay duties and brokerage fee's upon delivery. Please allow 10-21 days for delivery.